Rural Spine, Wyoming Spine Institute and Dr. Fabian were compared to the Spine Surgery Centers of Excellence participating in the Marshall Steele Program. 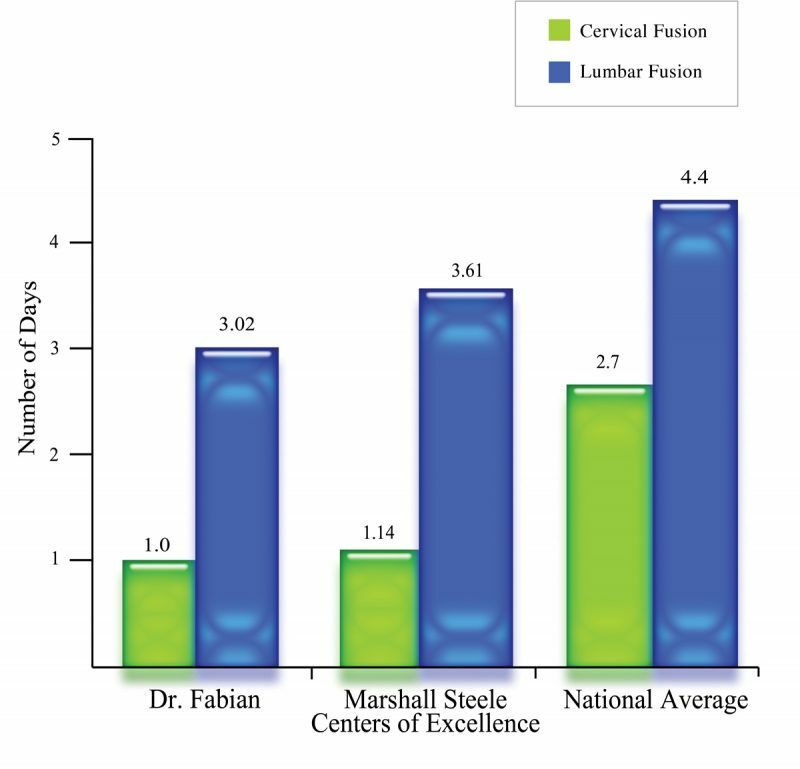 The independent review process of Marshall Steele highlighted that Rural Spine and the Wyoming Spine Institute performed “better than their average for Spine Surgery Centers of Excellence in all four categories” and that, “Surgery time is better than we typically see for all procedure types.” These Spine Centers were “The Best of the Best” and Dr. Fabian met or exceeded all of their performance benchmarks. Postoperative hospital length of stay (LOS) has found to correlate very well with overall patient satisfaction, overall complication rates, overall hospital care costs and rates of infection. 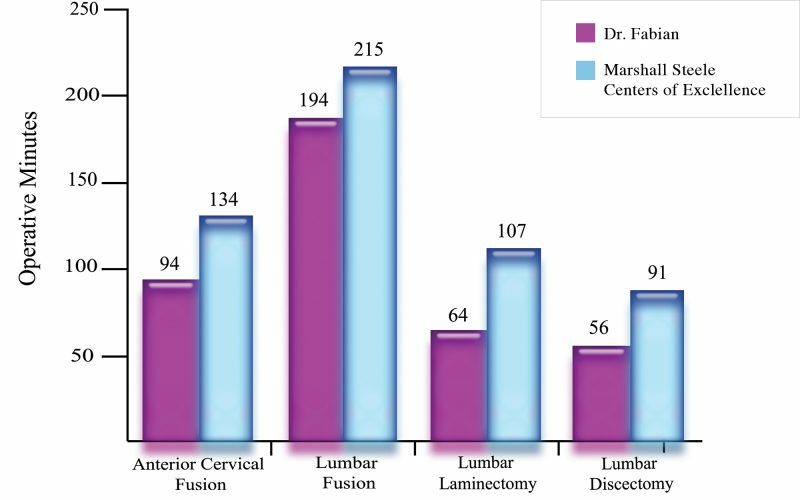 The average length of stay for Dr. Fabian’s patients is 3.02 days for lumbar fusion cases and 1.0 days for anterior cervical fusion, including data from single to multiple levels of fusion. Sending patients home prematurely just to keep hospital days and costs down is of no use if the patient has a postoperative problem and gets readmitted within 30 days. This has an adverse effect on the patient’s satisfaction and recovery, not to mention the overall cost of treatment. Under the direction of Dr. Fabian, our readmission rate has been less than 1%, with several consecutive quarters resulting in zero readmissions. This compares with a national readmission rate for spine surgery of >2.9%. Dr. Fabian is committed to keeping complications and in-patient treatment issues to a minimum to reduce length of stay (LOS) and readmission rates. The data shows the level of commitment to this goal and the overall success the program has had and continues to strive for. Rural Spine and the Wyoming Spine Institute have ranked in the top 1% when it comes to Dr. Fabian’s skill and the way he handles patient questions and concerns. Dr. Fabian has also ranked in the top 2% nationally for overall standard physician rank. 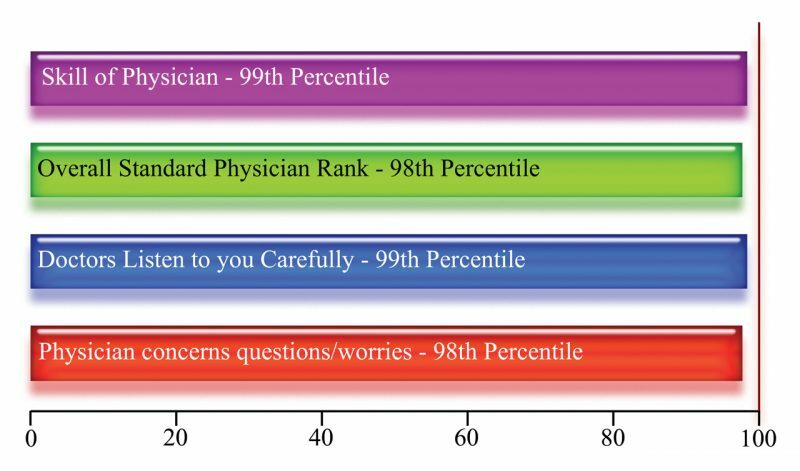 These scores highlight Dr. Fabian’s emphasis on open and empathic dialogue with his patients throughout treatment. The overall infection rate has averaged <1.0%. In 13 years, from 2004 to 2017, there have been ZERO cervical surgery infections and a single out- patient lumbar discectomy infection. 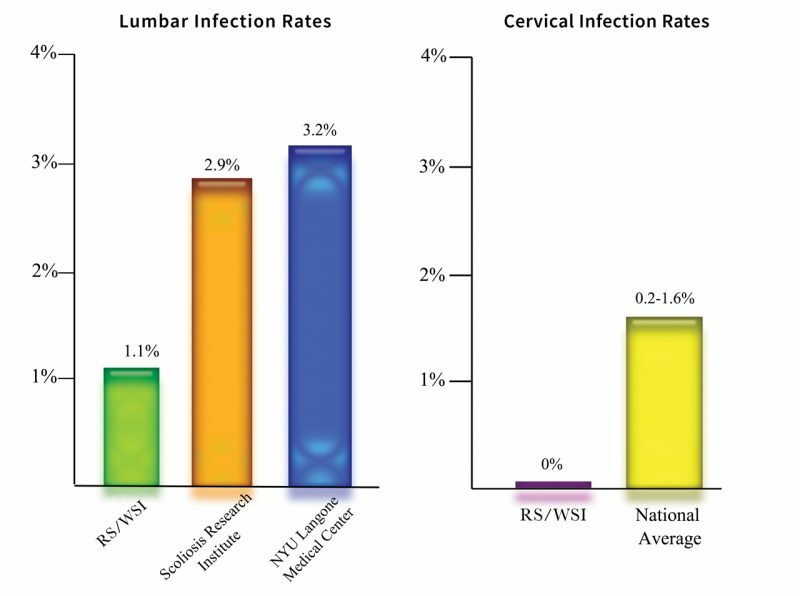 For lumbar spine surgeries requiring implants, the rate has been less than 1.1%, compared to the 2.9% value cited by the Scoliosis Research Society and the 3.2% rate reported by the NYU Langone Medical Center, or the 6.5% infection rate reported for Medicare patients. For anterior cervical fusion by itself, the nationally reported infection rate has ranged from 0.2-1.6% compared to ZERO for Dr. Fabian. We are proud of our national leading benchmark of an extremely low infection rate in our spine surgery patients. 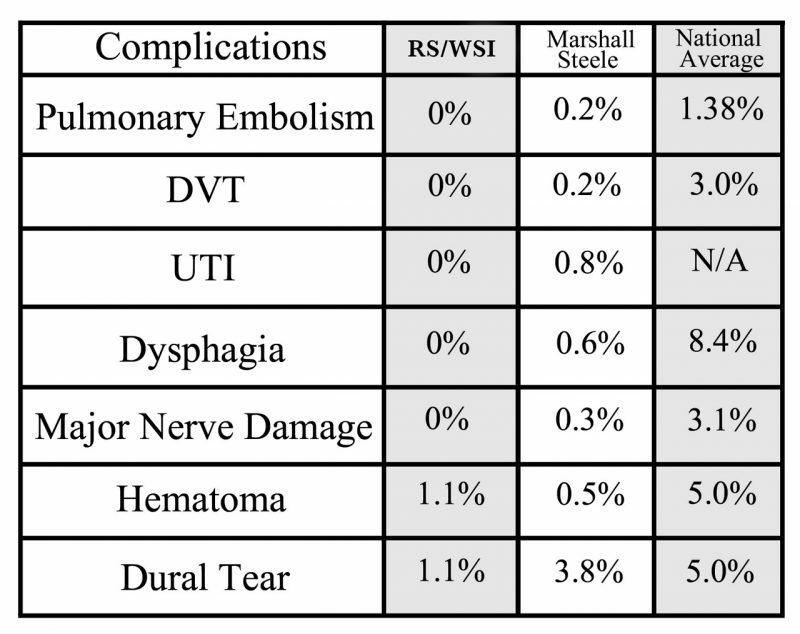 The table in figure 5 shows the complication rates for categories other than infection, compared to national standards. This data again highlights Dr. Fabian’s extremely low complication rate. Rural Spine and the Wyoming Spine Institute will continue to strive for clinical excellence exceeding national standards. This pursuit of individual surgeon and staff excellence requires a comprehensive team and system approach, assuring the best possible outcomes for our patients. We dedicate ourselves to providing the highest standard of care for our patients, with compassion, technical, surgical and clinical acumen.